How is it that I haven’t posted in 5 full days? I’m getting blog withdrawals. I can’t even say it was a particularly busy week but between one thing or another, time just got away from me. I feel like a dog chasing my tail! It’s a particularly busy weekend because everything seems to be on at the one time so hopefully I’ll have plenty to post in the next few days. Can you believe it’s December on Monday? The shopping days are running out, folks. So I’ll leave you with some graffiti sidewalk philosophy. I guess i find it quite apropos in light of the current economic climate. It seems we can’t turn on the tv or radio without more news of job losses and cut backs. So many of us are defined by what we do and when we lose it, we lose ourselves too. So, no. 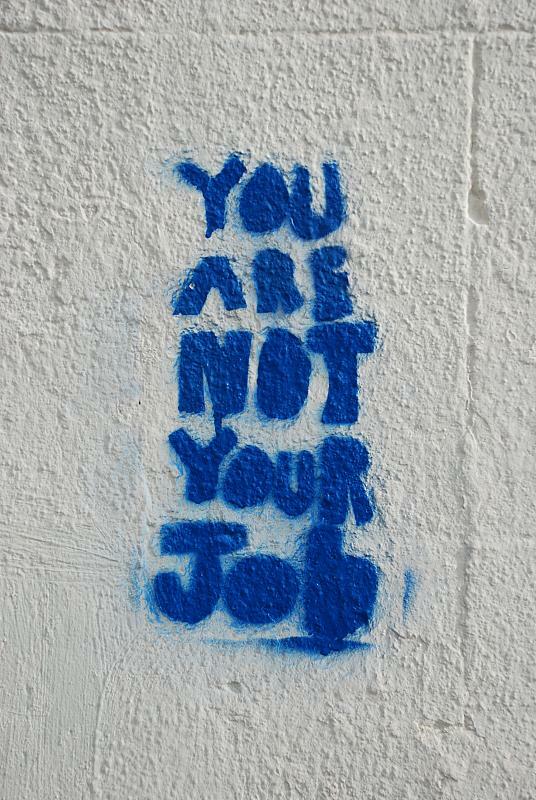 You are not your job. Eeeek. I haven’t even started shopping for xmas yet…. That is a great sentiment! !